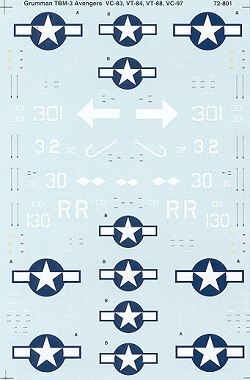 The second new 1/72 sheet is for the TBM-3 Avenger. All of them are in the tricolor scheme of sea blue, intermediate blue and white. I have to assume that this is a repeat sheet as the copyright date on the bottom of the instructions is 1966. However, I can find no reference to it so it may just well be an interesting typo! First one is from VC-97 aboard the USS Massar Strait in February 1945. It has the interesting hook geometric design on the tail. From VT-88 aboard the USS Yorktown, comes this TBM-3. It has the later tailcode markings appropriate to July 1945. #301 with the arrow on the tail is from VT-84 aboard the USS Bunker Hill in April of 1945. It has a yellow forward cowling. Finally, #30 from the USS Sargent Bay in July 1945. This VC-83 aircraft has the upper surfaces Dark and Light Gull Grey over White according to the placement guide, but I'd have to think that is a typo of some sort as I've not heard of that particular scheme being used. Available kits are from Academy, Airfix and Hasegawa. 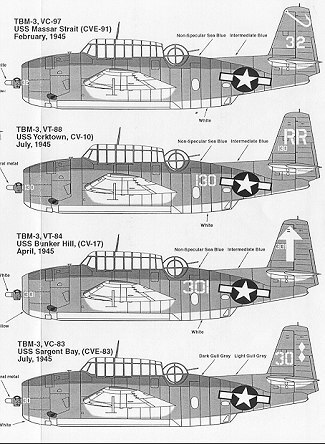 There are enough common markings to do three of the aircraft on the sheet. If you would like your product reviewed fairly and quickly by a site that has over 200,000 visits a month, please contact me or see other details in the Note to Contributors.